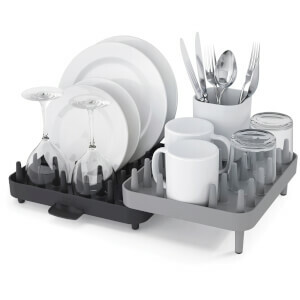 The Joseph Joseph Extend-Expandable Dish Rack is an innovative drainer that extends to double its size and comes with an integrated spout to help drain away excess water. 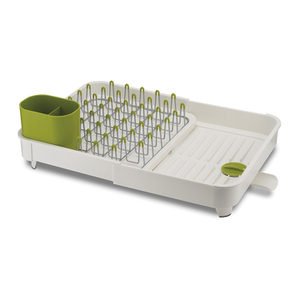 This spout can be rotated away and closed to trap water for draining later, allowing it to be used to create dish drying space anywhere. 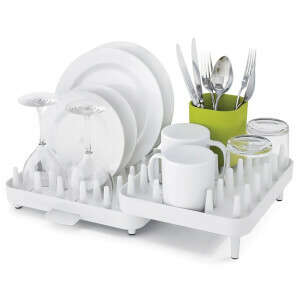 With plated steel prongs with non-scratch tips, the rack is safe for use with all types of glassware and crockery. 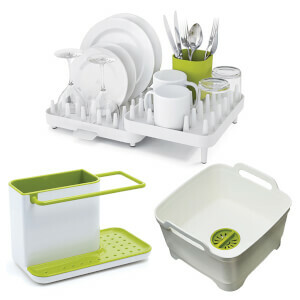 Further features include a movable cutlery holder, non-slip feet and a removable steel rack for easy cleaning.